ROKO (very fast, words running together): "Anyway, it turns out that I've never seen human abs before and it occurs to me you'll have an excellent set, so I was hoping you'd let me take some photos!" 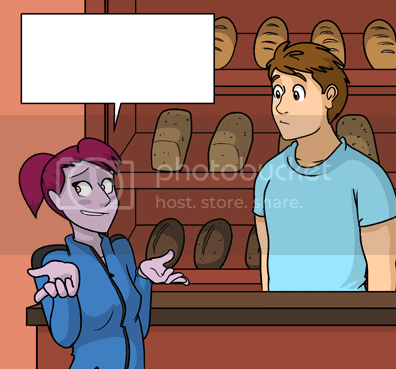 Roko: Anyway, I don't know HOW the bread got stuck in there but it totally wasn't my fault, so I was wondering if I could... get a replacement loaf? ROKO: "So, after all of that, he suggested that *ahem* t-that...that I go on a date with you. So, um uh would you uh like to g-go out on-n a d-date with me?" "So... um... someone may have told me that you have an affinity for certain types of bread... and... um... nevermind!" Roko: "Rogue? No no no! I'm clearly a paladin and always have been. What would a paladin know about sneaking around?" I see that Gyrre is a member of the Red Rogue Society! Well, at least I'm not in satin's service. To quote one of our UK forummites, "I blame the French." Bubbles: Sure, I can give you a hand. But I don't think you have the proper interface installed. BUBBLES: "Anyway, after I stopped that runaway Hummer, I found that I could do something new! Watch this! It always got a laugh in the barracks!" Bubbles: "... and then I took his arm and turned it like this. The tendons in his elbow did not have the same tensile strength as mine do, so when they snapped..."
Faye: "Please don't finish that sentence!"